Key Difference: Nanny refers to a person who is employed to take care of the children in a household. A nanny is usually a trained woman. A maid is someone who is employed to assist in the domestic chores. A maid is always a woman. Nanny refers to a person who is employed to take care of the children in a household. A nanny is usually a trained woman. A nanny can be hired on a part-time or on a contract basis. A nanny plays a vital role in the growth and development of the children. A nanny spends time with children and often suggests some activities and challenges for the children. A nanny is also referred to as a childminder or a child care provider. Many of them are certified in cardiopulmonary resuscitation (CPR) and may also be qualified in First Aid. 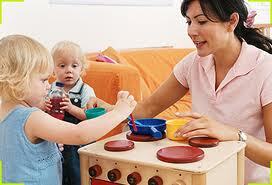 Professional nannies may also hold a degree or have extensive training in child development. Originally, nannies were the servants in households. However, later their role was specified in context to children. A nanny housekeeper balances between domestic duties and care of the children. A maid (housemaid or maidservant) refers to a female domestic servant. She is employed to carry out tasks like cleaning the house and cooking. Earlier, maids were often employed by great houses, and often generations of maids used to serve the same family. In poor countries, a maid also plays a role of nurse in taking care of the elderly or people with certain types of disabilities. Nowadays, maids generally work on a fixed schedule. A maid is often preferred by working women. There are various agencies which can be contacted if one wants to hire a maid. These agencies provide the options and also do the background checking before hiring a maid. Salary of a maid depends upon the duties she has been asked to perform. Nanny refers to a person who is employed to take care of the children in a household. A maid is someone who is employed to assist in domestic chores. Duties may include meal planning and preparation, laundry and clothing care, organization of play activities and outings, discipline, intellectual stimulation, language activities, and transportation. Duties may include domestic chores such as cooking, ironing, washing, cleaning the house, grocery shopping, walking the family dog, and taking care of children. Live-in nanny – entirely takes care of the employer’s children. Nanny share – more than one family hires the same nanny. Night nanny – takes care of the newly born baby especially at night. Professional Nanny – a trained or extensively experienced nanny. Live out Nanny – similar to a live-in nanny, just has her own domicile. Babysitter – a nanny who works in shifts with no particular pattern. Governess – she watches school children and is considered to be more of a tutor or an educator. Lady’s maid – reports directly to the lady. Works under the housekeeper. Housemaid – can be a head house-maid, parlour maid, chamber maid, laundry maid or under house parlour maid. Nursery maid – reports to the Nanny. Kitchen maid – assists in the running of the kitchens. Scullery Maid – responsible for washing up cutlery, crockery, etc. Between maid – roughly similar to scullery maids. Still room maid – a junior maid who is employed in the still room. Mainly from Greek: nanna "aunt". From Middle English: apocopated variant of maiden.